Is your tire in need of repair from either a nail or a blow out? Mt. Juliet Tire Center will see if tire repair is an option. When a driver thinks of tire problems, the first thing that comes to mind may be a blow out, but other issues may occur. An object can penetrate a tire without being detected causing a serious puncture. A slowly leaking tire will experience a continual drop in pressure, causing a number of problems including poor handling and gas mileage, as well as compromised safety on the road. Do you have a tire in need of repair? 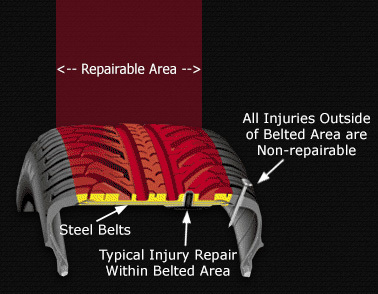 Our tire experts will provide reliable, safe, and thorough repair service. Contact us today! It is easy to put off tire repairs and just continue to re-inflate a leaking tire. Though it may seem like you don’t have time to come in for a repair, putting off it may mean the difference between a low cost repair and having to purchase a brand new tire. Driving on a damaged tire is not only unsafe, but also may compound the original damage. Because tires are a sizable investment, whenever possible, we provide a thorough and lasting repair that will have you back on the road in no time without further problems.